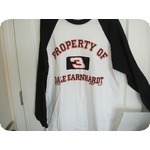 Dale Earnhardt Sr #3 large white and black jersey tee shirt with 3/4 length sleeves. New, front print only and one of a kind with tag. Just in large and extra large..Collector's item for sure.